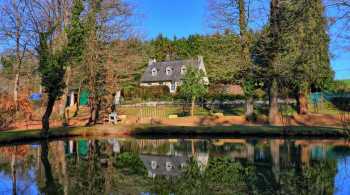 Set in the wooded countryside of Moustoir-Ac, 10 mns south-west of Locminé is this pretty 3-bedroom home. It was built in 1980 and offers you a stone-faced front wall by the patio area, then inside a large open planned "living room" with newly fitted kitchen, dining area, and lounge area around the fire place. Then there is a downstairs bedroom, a shower room, separate toilet and a garage. Upstairs you have a large landing area, two double bedrooms, a refitted bathroom and another long room which presently is used as a study but could make a children's bedroom. The house sits on a plot of over a quarter of an acre, overlooking the pond just over the road. The pond is about a quarter acre as well and sits in ½ acre, with a pretty stream and a small metal barn. Both garden areas are fenced for animals.